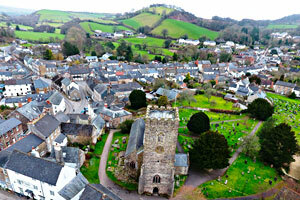 Bampton, a historic Charter Town, lies in mid Devon close to the Somerset border, and is on the edge of the Exmoor National Park. For the visitor, Bampton is ideally sited in rural Devon, and is at the centre of an area where there is much to do and explore. The whole of the centre of the town is a conservation area, and there are almost 100 listed buildings and other objects within the parish. Our little town has a surprising range of local amenities - shops, pubs, restaurants, businesses, and places to stay. It also has quite a history from the Romans to its early Saxon origins, the Norman castle, the wool and pony trade, the 12th century church, the quarrying of the local stone; now it is a thriving centre used by local villagers and visitors. 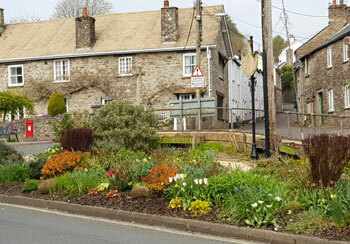 Bampton has been famous for over 40 years for its floral displays - Bampton in Bloom. A NEW VIDEO of the walk around town can now be seen here. Guided Town Tours are now available for groups - see Heritage Centre page. Easter colour on the Railway Bed in Bampton. Well done the Bampton in Bloom volunteers. Met Office Weather forecast for Tiverton Area - here.